An 8mm Tachinid fly. Good depth of field is achieved by focus stacking of 7 pictures. English : An 8mm Tachinid fly. Good depth of field is achieved by focus stacking of 7 pictures. Menger Sponge after four iterations. 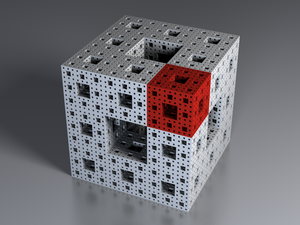 English : Menger Sponge after four iterations. Dead chick, probably a Blackbird (Turdus merula). English : Dead chick, probably a Blackbird (Turdus merula). Head-and-shoulders portrait of Chicago White Sox pitcher Ed Walsh. English : Head-and-shoulders portrait of Chicago White Sox pitcher Ed Walsh. A Bald Eagle (Haliaeetus leucocephalus). English : A Bald Eagle (Haliaeetus leucocephalus). Chicago and Northwestern railroad locomotive shops, Chicago, Illinois (United States of America). English : Chicago and Northwestern railroad locomotive shops, Chicago, Illinois (United States of America). A Turk's cap lily (Lilium martagon) flower. English : A Turk's cap lily (Lilium martagon) flower. Łukasz Sówka, speedway rider from Poland. English : Łukasz Sówka, speedway rider from Poland. English : A red apple. NASA astronaut Robert L. Curbeam, Jr. (left) and European Space Agency astronaut Christer Fuglesang, both STS-116 mission specialists, participate in the mission's first of three planned sessions of extravehicular activity (EVA) as construction resumes on the International Space Station. English : NASA astronaut Robert L. Curbeam, Jr. (left) and European Space Agency astronaut Christer Fuglesang, both STS-116 mission specialists, participate in the mission's first of three planned sessions of extravehicular activity (EVA) as construction resumes on the International Space Station. The inside of the Pantheon in Paris. English : The inside of the Pantheon in Paris. An Air Force Research Laboratory optical engineer performing an experiment with multiple, interacting laser rays. English : An Air Force Research Laboratory optical engineer performing an experiment with multiple, interacting laser rays. A Milky Way starscape taken from Paranal. The location of the starscape in relation to the rest of the galaxy. English : A Milky Way starscape taken from Paranal. The location of the starscape in relation to the rest of the galaxy. A Craticulina sp. fly, most probably Craticulina seriata, the only species of the genus found in Tanzania. The fly was around 6-7mm long. Pictured in Dar es Salaam. English : A Craticulina sp. fly, most probably Craticulina seriata, the only species of the genus found in Tanzania. The fly was around 6-7mm long. Pictured in Dar es Salaam. USS Bunker Hill hit by two Kamikazes in 30 seconds on 11 May 1945 off Kyushu. 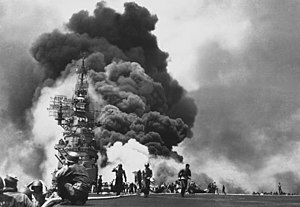 English : USS Bunker Hill hit by two Kamikazes in 30 seconds on 11 May 1945 off Kyushu. A Barn Owl (Tyto alba) in flight. English : A Barn Owl (Tyto alba) in flight. Sunset in Kuznetsk Alatau, South Siberia. English : Sunset in Kuznetsk Alatau, South Siberia. The Deluge from Gustave Doré's illustrated edition of the Bible. English : The Deluge from Gustave Doré's illustrated edition of the Bible. Zygaena filipendulae on Avena sativa. English : Zygaena filipendulae on Avena sativa. Head of a Greater Flamingo (Phoenicopterus roseus). English : Head of a Greater Flamingo (Phoenicopterus roseus).